The fourth edition of Asia Triennial Manchester (ATM18) showcased art, performance, dance and film by British and international artists on the theme of Asia. The ATM18 was presented at fifteen venues across the city from 5 – 21 October 2018. Curated by Alnoor Mitha – Manchester School of Art Senior Research Fellow and internationally acclaimed curator and art director – the festival was born out of Mitha’s research and based on his land mark exhibition, ArtSouthAsia, which was part of the Commonwealth Games Cultural programme in 2002. I got the chance to have a conversation with Mitha and we discussed the ideas behind the festival and his opinions on the role of art in itself. Jessica Mallard: Asia Triennial Manchester is the only triennial dedicated to Asian art in Europe. How did Manchester come to host the festival? Was it purely practicality or is there something more? Alnoor Mitha: Manchester is significant in so many different ways. It’s an immigrant city (we have around 200 languages spoken here) and is linked to Asia historically through the trade routes of the industrial revolution and the textile industry. It therefore seemed important for Manchester to have a programme that reflects on this aspect of its heritage, and also on how the city has impacted on the rest of the work. Manchester is also so unique. There’s a real ‘can do’ culture, you know? A strong sense of wanting to work collaboratively, and my vision was to do that. The way the festival works is in partnership with other organizations, sites and communities and the city is an amazing platform to do this. Things happen collaboratively here, in a way that they don’t in other cities. JM: This is the first year the festival has presented works in Oldham. What influenced this decision? AM: I actually worked in Oldham in the past. I was the curator there for a long time. I was at Huddersfield Art Gallery before that and when Rebecca Hill took over she was really keen to work with me. Gallery Oldham was fantastic when I was there and we used to do incredible projects. JM: Gallery Oldham has presented work by both UK and international artists and is a very well used space. It plays a huge educational role too. With the large South Asian community in Oldham, do you think it’s important for the festival to reach that community – and others like it – which might not participate in the central Manchester venues? AM: So Oldham was interesting because I’d worked there before, and also because Rebecca is a brilliant curator. We have very strong Bangladeshi communities there. It is of course important to always be trying to reach new audiences and to try and get new people engaged in the issues presented. JM: In Oldham in particular there’s quite a big gap between girl’s and boy’s academic performance in school (with girls generally performing better) and achievements post-16. So programing a successful female artist Jai Chuhan in particular has lots of potential to make a real difference in Oldham. Did you feel compelled by this? AM: I’ve always encouraged a good balance of showing work by female and male artists. We have a very large selection of women artists in this triennial actually. Me and Jai go back a long time. She’s a professor at Liverpool John Moores University and is a great role model. JM: The triennial advertises itself as “exploring contemporary debates.” Do you think that is the role of art? To encourage debate? Or do you feel that this is just the role of the biennial? AM: I think art is very inspirational in terms of what artists do and say and how they present work, but they also respond to politics and throughout the life span of the festival I’ve always thought each edition should have a theme. The theme always responds to society or societal issues. If I look at the work I’ve done since 2008, there’s definitely a pattern. JM: And does that theme come from you alone? AM: Yes, I conceive the theme and sometimes I talk to other colleagues and make the themes more focused. For 2018, it was a conversation with Professor Sarah Perks who, at the time, was the Director of Visual Art at HOME. I think having this year’s provocation as “who do you think you are?” or “where are you from? No, where are you really from?” was really interesting because artists were then able to define that concept in a way that’s much more creative. It’s also more adaptable to what audiences can get to grips with. So, in terms of the debate, a theme is important. At the opening on 5 Oct we had a debate with the artist Fa and Fon Watkins on how they’ve been perceived and how they’ve had to ‘become white’ in terms of being accepted in society. It was really interesting to hear from these two young women and listen to what they understand as racism. I think it’s very important to establish a platform, a conversation, a dialogue. This particular piece of work was curated by a very young curator Amani Mitha, who presented the idea of showing their work. JM: How would you respond to challenges that might say you are preaching to the converted? That audiences of these venues are stereotypically quite liberal and accepting? AM: Part of that is true. But at the “Who Do You Think You Are? symposium we held on at the Whitworth art gallery, for example, we had different academics, artists and curators talking about their work and the audience probably was from a broad artistic community, but they were still quite surprised at what they were listening to. But you’re actually right, we do need to also have debates with people who aren’t necessarily, you know, aware of contemporary art. We tried to do that in 2008. We had this idea of “tea houses”, so we asked artists from Asia to bring their own different teas (from China, Hong Kong, India and so on) and we went to different sites like pubs and community centers where we were able to have challenging discussions in a friendly environment. JM: Over a cup of tea! AM: Yes, over a cup of tea! JM: Do you see your role as a curator being to support artists that you think should have more exposure? Do you think that this practice is risky? I’ve always supported very young and upcoming artists, so I tend to take risks on their behalf, but they’re calculated risks. So, for example, taking an artist that other people might not show and dissecting their work in a way they’ve not done before helps them to see their art in a completely new way and progress. To take a bit of risk is a good thing – it works for the artists and it works for the festival. JM: Chinese art is getting much more exposure in the UK, as our governments push this ‘golden era’ of race relations, and flights between our cities and Chinese ones increase every day. Do you think these race relations are having an affect on art? Or, more specifically, does it have any impact on the festival? AM: Obviously it has an impact. But as a festival, we’re not as interested in politics with a capital ‘P’. We’re more interested in artists and how they negotiate with their own political views. Take for example Han Bing. He’s Chinese and in 2008 I invited him to do a cabbage performance where 100 people walked around the city with a cabbage on a leash. He comes from a very poor background. His diet was cabbage, so he subverted this idea of a cabbage to explore his feelings on the rising bourgeois of China. JM: Yes, that project was fantastic, it raised questions about humanity and commodity rather than being directly confrontational. The meaning of art is so subjective that it transcends binaries. Words or a manifesto can be argued for or against. Do you think that it’s important for art to transgress that? AM: Yes absolutely! This time we did a mirror project (smoothing towards utopia) with Han Bing. 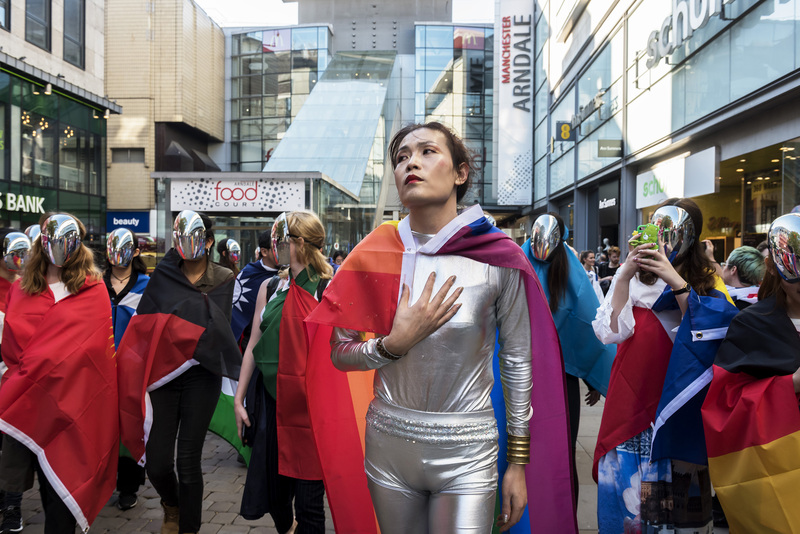 It was a public procession from Manchester Cathedral across the city where participants wore the flags of different nations; singing, reciting and chanting words that they identified with personally but with their faces covered by mirror masks, so their identity was hidden. This procession was an invitation to consider who has the right to claim membership of a given community and what extent cultural differences must be erased in order to belong? What is lost when our differences are “smoothed” away, and can the result ever really be utopian? This guy came up to me and asked what we were doing, and when I explained he said: “you know what, you made my day.” Han Bing was protesting the idea of borders (rather than one political party or ideology) and people really related to that. By embracing multiculturalism and embodying the spirit of the city’s radical past, the ATM resonates with the local people of Manchester whilst also conceding to the international. As it grows from strength to strength every three years, it only works to further progress the cultural agency of this rainy northern city that too is growing in strength. From Manchester Metropolitan University’s recent investment in cultural research to the huge number of towering cranes finally finishing whatever office blocks or high end flats they are creating – not to mention the approaching opening of The Factory – the city which hosts the next ATM will look very different. I very much look forward to seeing how the festival reacts.